Net sales decreased by 2% to SEK 33,651m (34,344). Organic sales, which exclude exchange rate effects, acquisitions and divestments, increased by 3%, of which volume accounted for 2% and price/mix for 1%. The divestment of the baby diaper business in South Africa decreased net sales by 1%. Organic sales increased by 2% in mature markets and by 3% in emerging markets. 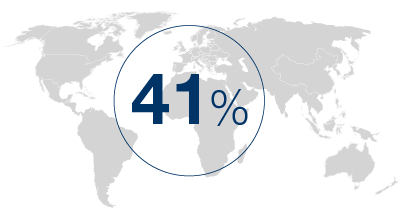 Emerging markets accounted for 41% of net sales. Exchange rate effects decreased net sales by 4%. For incontinence products, under the globally leading TENA brand, organic sales increased by 2%. Growth is attributable to emerging markets and Western Europe. For baby diapers, organic sales decreased by 1%. Western Europe showed high growth, while sales in emerging markets decreased. For feminine care products, organic sales increased by 10%, attributable to emerging markets and Western Europe. 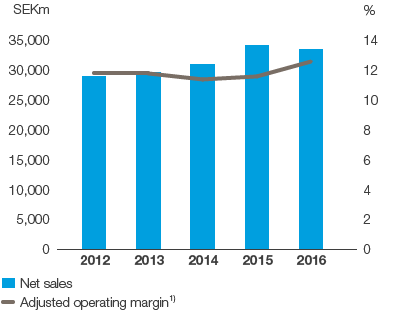 The adjusted operating profit1) rose 7% (10% excluding currency translation effects and divestments) to SEK 4,255m (3,990). Profit was favorably affected by higher volumes, a better price/mix and cost savings. Higher raw material costs had a negative earnings effect. Selling costs were higher, and investments were made in increased marketing activities. The British pound and Mexican peso have weakened against several trading currencies, which had a negative earnings effect. The adjusted operating margin1) was 12.6% (11.6). The adjusted return on capital employed1) was 31.8% (29.2). The operating cash surplus amounted to SEK 5,314m (5,018). 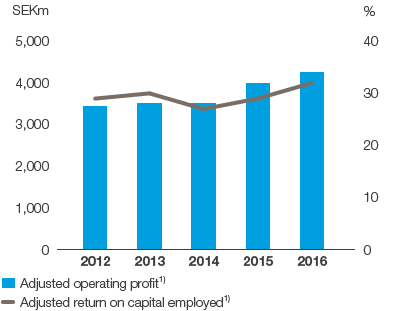 Operating cash flow amounted to SEK 4,723m (3,792). Capital expenditures amounted to SEK 1,896m (1,743). of the business area’s net sales in 2016. In emerging markets, organic sales increased by 3% in 2016.